We’re starting a special Friday featured category that will list Friday fan favorite contests on facebook, money saving ideas, coupons and more. This week we’re starting with Friday Fan Freebie Giveaways and Contests. 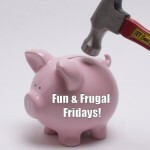 Many companies are using facebook to reward some of their fans each Friday. You will usually have to “like” the page and fill out some type of short form. We’ll hunt down the easiest ones enter and post them here each Friday morning. If you find another, please let us know either here or on our facebook page. If it checks out, we’ll add it to the list!